Building owners and facility managers routinely receive complaints from their employees and tenants about poor indoor cellular signals. In a realistic scenario, a user may receive 1 or 2 bars indoors while their reception outside receives full bars – this can frustrate anyone trying to complete work or even just browsing through their phones. The simple and easy conclusion is that the Operators such as AT&T, Verizon, Sprint or T-Mobile are to blame for the poor cellular reception. But is that a fair and truthful conclusion? What are the real reasons buildings exhibit poor cellular coverage problems and what solutions are there to fix it and to keep everyone happy? Since the mid-1980’s, cellular operators have been building out the macro network to provide wireless coverage throughout the country. Today these networks nearly cover 99% of all urbanized areas of the United States. The signals carried from these macro cell towers and to millions of smart phones rely on RF (radio frequency) waves. As good as RF is in the outdoor environment, even with large numbers of cell towers, RF does have limitations. As with sound waves, RF degrades over distance as well as having limiting penetration power through obstacles. Ever have trouble hearing someone speaking through a wall? Figure 1 below shows how a typical cellular signal on a 1900MHz frequency might react as it leaves a nearby cell tower. The signal can pass through the air and travel a fairly lengthy distance without much loss, but once it hits obstacles such as trees or tall buildings, the signal quickly degrades. Being able to wirelessly connect people outside is easy enough with the number of cell towers, but connecting them inside buildings is more of a challenge. Development of buildings today show a stark contrast to what they were in the past. 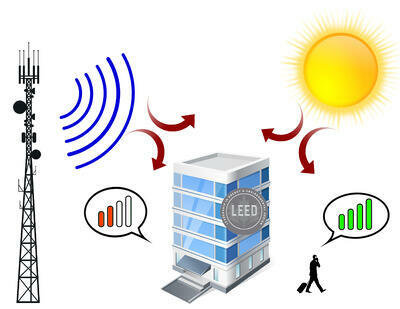 For one, new technology has allowed buildings to be more energy efficient and are kept at a constant temperature reducing HVAC costs, which not only has been proven to be a real money saver, but also it has helped hinder RF signals. Low-E glass is designed to keep out the heat by reflecting the sunlight, but this also reduces the ability for RF to penetrate inside the building. In fact, Low-E glass has the same RF blocking affect as a 12” cinder block wall! 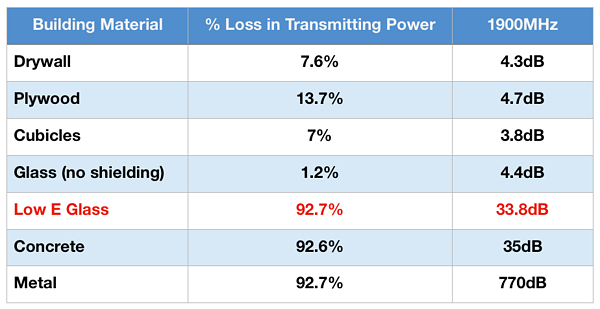 Figure 2 below shows building materials and how much it can reduce RF signal levels – and by reviewing this data, you can anticipate the difficulty a user would have on receiving a cellular call. Now that we have an idea of how RF signals and the affects of signal blocking work let’s see what solutions are available for building owners and facility managers to combat poor in-door cellular signals. There are a number of solutions from wi-fi calling, small cells to DAS systems. Each of these has their pros and cons depending on the buildings size, requirements and budget. Wi-Fi is a well-known protocol for connecting, sending and delivering information between devices. What’s not commonly known is that the latest smartphones can take advantage of Wi-Fi for connecting to the internet to make voice calls. This feature is probably the most economical for building owners and facility managers to implement as most buildings have this infrastructure already in place. All that is needed is to turn on Wi-Fi calling on the device and the network administrator to allow access on their network. However there are a few downsides to this solution. First, Wi-Fi was not intended for voice communications, but rather for data traffic. If the Enterprise needs to dedicate channels for voice this could cause significant data service interruptions or slowdowns. And since Wi-Fi is unlicensed spectrum the susceptibility to interference from other signals such as computers, other Wi-Fi networks, etc. could cause poor reception or call quality. Secondly is that the buildings’ Wi-Fi infrastructure needs to be comprehensive enough so that there aren’t any ‘dead spots’ where a call could get dropped. A large building that has many tenants might not be a good fit as the user would only be able to connect in a small area. Finally, there is the operation of hand-offs. Typically when a cell user is talking and moving outside, the cell tower and others around them are constantly communicating in case the user goes out of reach of the current tower. If that happens another cell tower takes over and the first tower ‘hands-off’ the communication responsibility to the second tower. However, if a user is inside a building on Wi-Fi then exits the building or goes out of range of the AP (Access Point), there may not be a cell tower for the call to hand off to, and therefore the call is dropped. This last point is probably the most important reason that Wi-Fi calling should be the last option to solve in-building signal issues as it doesn’t truly solve the problem. In addition, not all operators provide for Wi-Fi calling; and, some that do only allow it if the cellular device is purchased from them. Small Cells have been generating a lot of buzz for the last couple of years in the telecom industry. Operators have been looking at ways to deliver excellent in-door signal while limiting the load on their macro network. 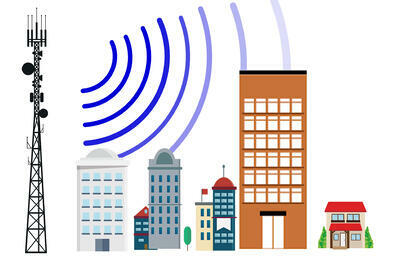 A small cell is a device that is placed in a building that can deliver signals similar to a Wi-Fi network. Although still connected through an internet connection, the signal is delivered directly to the core network. Costing anywhere from a couple hundred to a few thousand dollars for the device, it gives the users excellent signals, but to ONLY those on the network it is designed for. This means that if the building owner or facility manager wants to cover multiple Operators, ie. Verizon and AT&T, they will need to purchase two small cells, one from each Operator, since their technology to the network is proprietary. By doing this the cost for implementing doubles since it requires multiple devices and cabling/antennas if covering a large area. Although this solution is better than Wi-Fi, multiple Operator deployments are messy; there is a better solution. DAS or Distributed Antenna System is a network of antennas that are systematically designed and installed throughout a building. In some cases, a donor antenna is placed on top of the building that grabs the nearby cellular signals from the nearest cell tower and then distributes it to the antennas throughout the building; bypassing the glass, concrete and other RF obstructing materials that it can’t pass through without this system. In other cases, the operator provides a dedicated signal source (typically called a BTS) and uses this to provide the cellular signals to the DAS. What makes this better than Wi-Fi and Small Cells? For all the disadvantages of Wi-Fi: reliability and hand-offs; Small Cells: single operator and redundant infrastructure, DAS can overcome these shortcomings and provide a solution that can solve the signal problems. Most DAS systems, by any manufacturer should be able to support multi-bands and multi-operators so that only a single line of cable is needed to support the system rather than having a conundrum of cables and antennas strewn throughout the building. This extends to the overall cost of the system keeping it more economical than installing multiple small cells. And since you are directly connected to the operator’s network through the DAS system, there aren’t any call quality or handoff issues as with Wi-Fi calling. 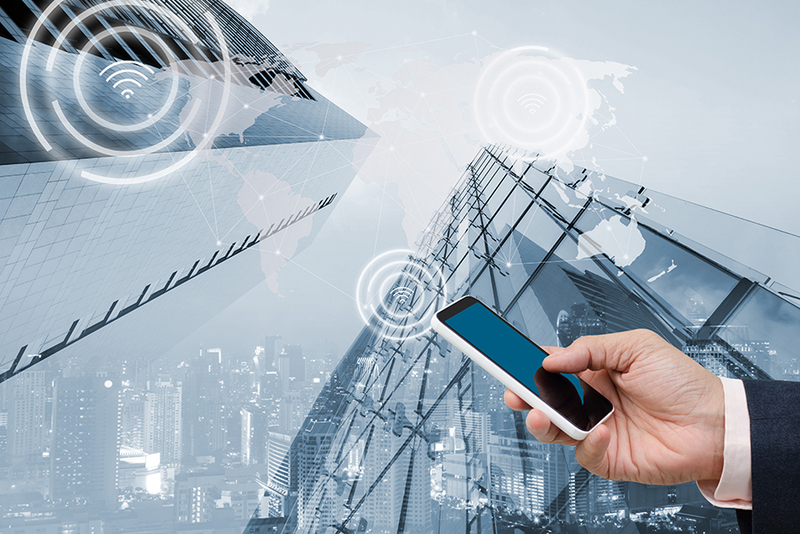 Building owners and facility managers who recognize and more importantly understand the reasons for poor in-building cellular coverage can implement a solution that best fits their needs. For Wi-Fi and limited small cell installations there isn’t much technology expertise needed. However if a larger building or one with multiple-carriers are required, DAS requires the project is designed and installed by a licensed professional SI (Systems Integrator). DAS solutions are regulated by the FCC meaning that the installer must have been trained and certified by the manufacturer of the equipment so that it is properly installed and commissioned to provide the users the best possible service without interrupting the Operators network. When evaluating SI’s make sure they have the proper certifications. They should be able to present the certifications upon request. Designing and installing a proper DAS system also requires engineers to understand the surrounding environment signals so they can properly configure the system, typically through RF software like iBwave to simulate the signal propagation ensuring adequate signal coverage and avoiding interference issues. An experienced SI, will be thorough and take on-site signal tests to compare against the iBwave design and adjust as needed before installation starts. Finally, it’s always good to find an SI that has a relationship with the Operators. When installing and putting a system on the Operators network, Operators need to review and approve the design before installation to ensure it will not affect the macro network. SI’s that have these Operator relationships greatly reduces any problems down the line when commissioning takes place. Although a difficult task in certain markets, calling the regional Operators headquarters and talking with the DAS department and getting an SI reference couldn’t hurt. Now that we have reviewed through the various solutions for in-building coverage, DAS proves to have countless benefits that any building owner or facility manager can gain from. Customer, tenant, and employee satisfaction is one of the main concerns for any building owner, with the proper setup with a DAS, cellular subscribers can experience extended coverage for both indoor and outdoor communications. Although the upfront costs are more costly, in the long run this solution is more budget friendly than purchasing other solutions, only to be dissatisfied, and ending up replacing it with something else. This translates into satisfied tenants who tend to lock into longer leases and better profit margins for the Enterprise customer. One notable point is that owners can inquire about their installation, processes, technical support and more with a team of certified engineers that can walk them through any steps or answer any questions and even perform an onsite training. At Comba, we pride ourselves on excellent service with all our products, especially for DAS and are committed to ensuring the satisfaction of all of our customer’s project needs. Ultimately the choice is dependent on the building owner or manager and the cost they are willing to take for benefits in the short or long term. 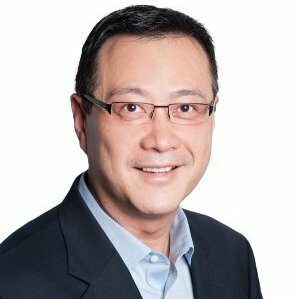 Patrick Lau is VP of Strategic Development, for Comba Telecom, Inc.’s North America region and is a veteran in the telecom industry with over 20 years of experience who has helped to develop opportunities with project management and sales team for in-building or enterprise spaces. With a Master of Science degree in electrical engineering, Lau has worked in engineering and business development roles at Comsmscope, Allen Telecom, Allgon, and Andrew Corporation and is an avid speaker at major events such as Mobile World Congress, IWCE, WIA, ACUTA, SEAT, DASpedia, DAS Congress and more.